While Houston benefits greatly from advances in its energy and chemical industries, one of the prime economic drivers for the city’s economy is its growth in the service industries. Nearly 16 percent of the Houston working population work in insurance sales, real estate and personal finance. This number continues to grow and so does the revenue generated by these industries. 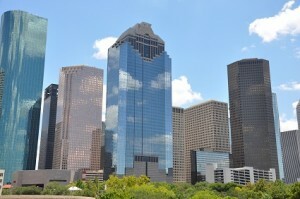 Houston has also taken to offering incentive packages to companies willing to establish offices in the inner-city areas. The city refers to these areas as Reinvestment Zones and there is a significant drive by the city to revitalize its inner-city areas to boost the economic stability of the entire region. The office vacancy rates for the areas in and around Houston are quite low and have been dropping for sometime. As of September 2014, the vacancy rate for the Downtown District stood at 8.8 percent. For the entire city of Houston, the vacancy rate for all office space is 9.8 percent. This is a number that rivals fast-growing cities such as San Francisco and Las Vegas. In total, the city of Houston has 1,264 office buildings offering 224,978,759 square feet of office space. But as of September 2014, only 20,911,380 square feet is immediately available for rent. As with all metro office space throughout the United States, Houston office space is separated by Class A and Class B rates. Class A buildings are the more prestigious buildings with the premier locations, while Class B buildings are the functional buildings that do not offer the premier locations or amenities that the Class A buildings offer. In Houston, the cheapest office space is found in the Class B buildings of the FM 1960 District. Office space in Clear Lake is renting for $15.32 per square foot and Clear Lake as a vacancy rate of 15.2 percent. Development of new space in the FM 1960 District has slowed as the city is only adding 770,000 square feet of new space in 2014. The Class A office complexes of Houston’s Downtown District command the highest rents in the city at a cost of $41.62 per square foot. Prestige still reigns supreme in the business world as the Downtown District vacancy rate is the one of lowest in the city at 8.8 percent. As of 2014, the city of Houston was in the process of adding 1,626,638 square feet of new office space in the Downtown District. For further information about office space in Houston available for immediate rental click here. This entry was posted on Thursday, October 30th, 2014 at 12:55 am	and is filed under Business Advice, Business Spotlights, Business Start Ups, Texas. You can follow any responses to this entry through the RSS 2.0 feed. You can leave a response, or trackback from your own site.